Grupo 7C Racing Stable's Grand Tito was the multiple-length winner of Saturday Grade 2 Mac Diarmida Stakes at Gulfstream Park. The 6-year-old son of Candy Ride took down the 1 3/8 mile contest over the firm turf course in 2:12.55 for trainer Gustavo Delgado. Emisael Jaramillo, profiled earlier this week in The Paulick Report, allowed Grand Tito to settle in just behind the leading O'Prado Ole until the final turn of the Mac Diarmida. Kaigun was in fourth early, but nearly a five-length gap separated him from the leading pair. O'Prado Ole set early fractions of :23.89, :48.88, 1:14.28, and 1:38.06. Entering the stretch, Grand Tito took the lead and strode out strongly toward the wire for Jaramillo, winning by 1 1/4 lengths. Kaigun closed strongly from the center of the pack but had to settle for second, as Mr. Maybe closed from the very back of the field to be third. Bred in Kentucky by Sandra and Hargus Sexton as well as Ben Walden, Jr., Grand Tito was a $225,000 yearling purchase at the Keenland September Sale. Now with 10 wins from 34 lifetime starts, Grand Tito's career bankroll stands at just over $705,000. 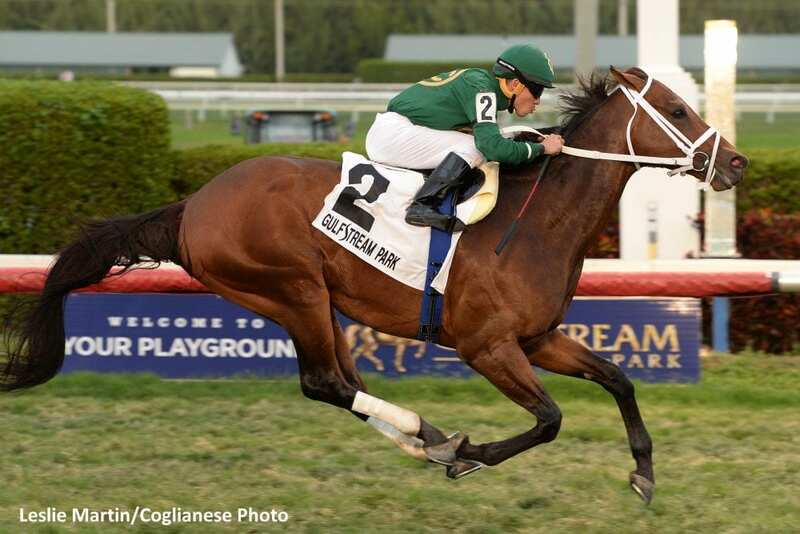 This entry was posted in Racing and tagged candy ride, emisael jaramillo, grand tito, gulfstream park, gustavo delgado, kaigun, mac diarmida stakes by Paulick Report Staff. Bookmark the permalink.